This is one of my favorite vantage points in all of Colorado. 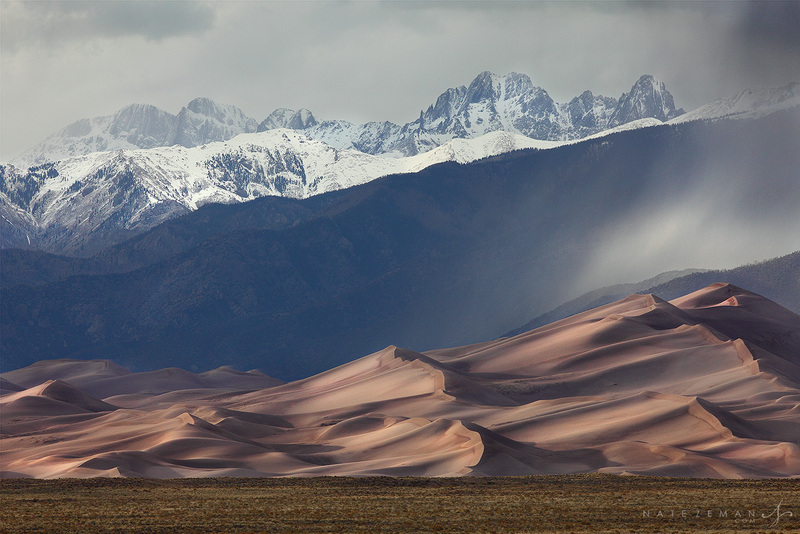 Even though this view is seen directly from the road leading into Great Sand Dunes National Park, it is a shot that has eluded me for many years. I've spent many sunsets at this exact spot, but have never come away with exactly what I wanted. 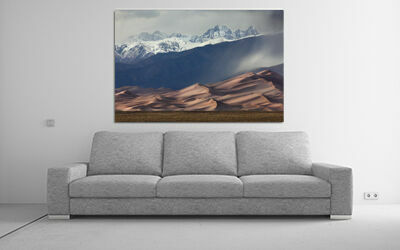 What I love about this scene is the contrast between the jagged peaks of the Sangre De Cristo Mountains and the soft lines and warm colors of the dunes below. On this particular spring evening, I wasn't even expecting to get a photo from this location because the mountains were completely socked in with clouds. As always, I decided to stick around and see what happened, because you never know when mother nature is going to give you a gift. After a bit of waiting, the weather started to move eastward past the dunes. The mountains were first to appear and I was delighted to see a fresh dusting of snow capping the high peaks. A heavy rain storm moved across the dunefield, and like a curtain, unveiled the entire scene. Finally I got the image I've wanted of one of my favorite views.